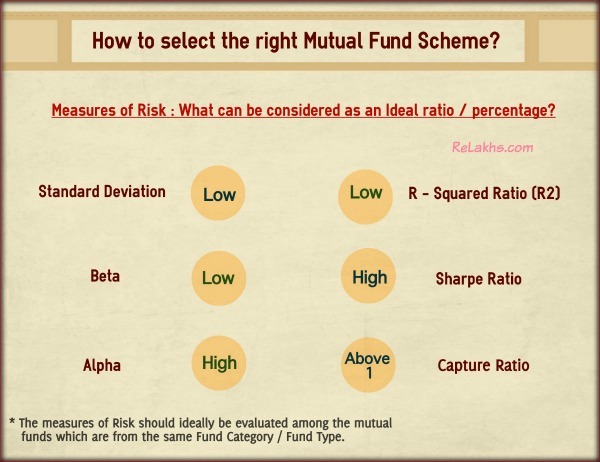 How to select Best Mutual Fund Scheme based on Risk Ratios? You are here: Home / Mutual Funds / How to select the right and best Mutual Fund Scheme based on the Measures of Volatility? How to select the right and best Mutual Fund Scheme based on the Measures of Volatility? The two terms which are important here are ‘Returns’ & ‘Risk’ (or Volatility). A mutual fund scheme invests in Equity and/or debt securities. These are the underlying assets of a mutual fund scheme. The returns generated by these securities can be VOLATILE. To evaluate how VOLATILE these returns are? How consistent are the returns? Actually, these ratios are referred to as ‘measures of Risk’. But, they measure the volatility associated with a financial instrument. This volatility leads to RISK i.e., you may or may not get the desired returns to achieve your financial goal(s). Compare the returns generated between Fund A and Fund B.
Analyze and evaluate the volatility of returns between Fund A & Fund B based on measures of Risk. You can also compare returns of Fund A with the returns of its Benchmark index / Fund Category. You can evaluate the measures of Risk between Fund A with that of its Category or Benchmark index. How to select the best Mutual Fund Scheme based on Measures of Risk/Volatility? Let’s now discuss more details about these ratios and try to understand their importance when selecting the right and best mutual fund scheme. You need to give importance to both returns and measures of volatility while short listing mutual fund schemes. Standard deviation for a mutual fund tells you how much variance there is in the fund’s returns. Based on SD you can analyze the consistency of returns generated by a mutual fund scheme. It’s useful in a long-term sense (longer time period). A Standard deviation of say 20 means that fund will generate plus or minus 20% from its long term average returns. If a fund has say a 12% average rate of return and a standard deviation of 4%, its return will range from 8-16%. Higher the Standard Deviation, higher the fluctuations in returns. So, you need to look out for a fund with a low Standard Deviation. Beta gives you an idea on the correlation between a fund’s performance and its Index. High Beta or low Beta, which one is good? If you are a risk-averse investor, low Beta is good. High Beta does not mean the fund’s performance is better than its index. It just indicates that returns can be volatile (up or down) when compared to the fund’s benchmark index. If a mutual fund has Beta of 1 that means the performance of the fund will perfectly match the performance of its benchmark index. The Beta can be a negative figure too, which indicates that there is no correlation between the performance of fund and its benchmark index. Alpha gives you an idea whether the fund has out-performed its benchmark index or not. It measures the fund’s performance (returns) and risk relative to its benchmark index. Alpha is measured as a percentage so an alpha of 10 means the fund outperformed its benchmark by 10%. So, ideally you would like a fund to have HIGH Alpha. Higher the Alpha the better. R-Squared measures the relationship between a portfolio and the Fund’s benchmark. Kindly note that it is not a measure of the performance of a portfolio. However, it measures the correlation of the Fund’s Portfolio’s returns to the Benchmark’s returns. Most of the Large cap & Index funds will have high R-Squared ratio. It measures the returns with respect to risk taken by the Fund. It is a risk-adjusted measure. A good Fund should be able to generate decent returns without taking too much risk. These ratios show us whether a given fund has outperformed i.e., gained more or lost less than the broad market benchmark during periods of market strength (bull phase o upside) and weakness (bear phase or downside), and if so, by how much. Ideally, you would like a fund to have higher Upside capture ratio (>100) and lower downside capture ratio (<100). Lower the downside capture ratio, better the ‘DOWN-SIDE PROTECTION’. Some funds may give you the best returns when markets are UP but they do not necessarily go on to out-perform when the markets FALL. So, we need to identify the funds which outperform in both the scenarios. Identifying the funds that ‘lost the least when markets tanked’ should also be given importance. Capture ratio is calculated as Upside Ratio divided by Downside ratio. For example, a fund with an upside-capture ratio of 100% and a downside ratio of 80% would have an upside/downside ratio of 1.25. Any ratio above 1 means that a fund does a good job of capturing gains during bull phases while lessening the impact of bear markets. Sortino Ratio : It is a variation of Sharpe Ratio. It factors in only the downside or negative volatility. Omega Ratio : The Omega ratio is a relative measure of the likelihood (probability) of achieving a given return, such as a minimum acceptable return or a target return. Where to get information on important Measures of Risk Ratios? Where to find the values of these Risk Ratios? Are there any online portals which provide details on these measures of risk? Yes, the details are readily available on portals like Valueresearchonline & Morningstar. You may click on ‘Returns’ tab to analyze the Funds’ performances. You may click on ‘Risk Stats’ tab to evaluate the performances of these funds on various Risk ratios. Click on any individual Mutual Fund Scheme link and you can find details about risk ratios related to that specific Fund, its Benchmark Index and also of Fund Category in the same table. 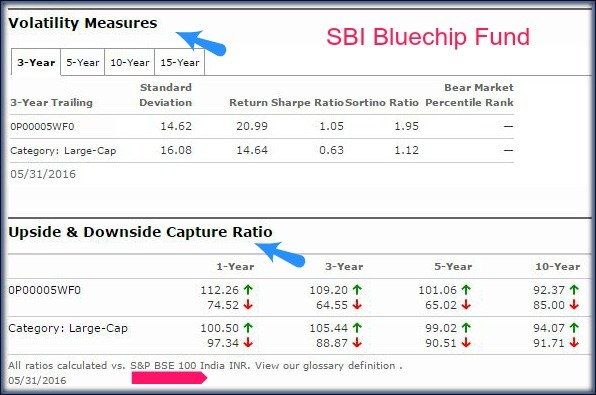 Below details are for SBI Blue Chip Fund Vs S&P BSE 100 (its benchmark index) Vs Category (Large-cap). You may also find risk ratios’ details in Morningstar portal. Visit Morningstar.in portal and click on ‘Tools‘ menu option. You may click on ‘Fund Risk Measures’ to know the details of Risk ratios of a Fund. You can click on ‘Category Risk Measures’ to evaluate the category wise measures of volatility. Performance (Returns) is not everything. If a fund generates high and abnormal returns but takes too much risk (unwarranted) then the returns may plummet (or) the performance may not be consistent. So, as a mutual fund investor you would like to invest in a product which balances risk and returns. It is prudent to analyze both returns and risk ratios before shortlisting the best Mutual Fund Schemes. Do you evaluate your MF Schemes based on these measures of Volatility? Kindly share your views and comments. Cheers! I m 38year old. I would like your suggestions on my MF portfolio. Plz suggest me is it right way? Reliance multi-cap has not been performing well. You have a large cap and a mid-cap fund, hence a large+mid-cap oriented fund like Principal EBC may not be really beneficial.. kindly re-check..
Maan gaye Sirji!!! Sir I have active (currently live) investments in MF schemes from 2011! From where can I get “historical NAV” data? The AMFI site does allow download of such data (say in XL file). I have been misguided by local consultants. Please oblige by providing the needed instructions. Kindly go through this article..
One more silly doubt…Why nobody is encouraging investing small lumpsums like 10k , 20 k frequently in large cap MF’s like Axis Blue chip etc.. as an alternative to multiple FD’s? May I know your investment objective(s) and time-frame? You may kindly continue with your SIPs in two of your existing funds. Ideally, we should not compare a fixed income product FDs with Equity Funds (large-caps). I am 29 years old. Currently I am investing in blow mutual funds and planning to invest for 5 years. I am investing in mutual funds for my daughter studies. Could you please let me know my portfolio looks good or do I need to make any changes? You may retain either of two large cap funds (Birla frontline or SBI bluechip). You may consider discontinuing Sundaram fund. Kindly read : MF portfolio overlap analysis tools. Currently on every month (SIP) I am investing in below equity fuds. After making changes My Portfolio looks below. Please suggest me whether I am taking right decision or not? If your investment time-frame is around 5 years, you may reduce allocation to mid/small cap funds. Thank you so much for your reply.I appreciate your time and efforts. I did not get your answer. Can you please elaborate more. please let me know what changes do i need to make in my portfolio? You have invested in mid-cap funds like Principal Emerging, Mirae Emerging, and small cap fund like DSP micro cap. Advisable to stay invested in these kind of mid/small cap funds for longer period (beyond 5 years). In case, if you need money after 5 years, you may reduce SIP amount to these and re-allocate the amount to SBI Bluechip or Kotak funds. (or) you may even drop one mid/small cap fund and can consider opting a balanced fund. Excellent article for newbies like me. Technical terms, definitions and concepts have been explained in very easy to understand language. Best thing I like about ReLakhs articles is easy examples with images/screenshots. These articles are very helpful for learning how and why stocks perform(ed) the way they do. Keep visiting ReLakhs and kindly do share the articles with your friends! Hi, Sree. I am Saravanan. My age is 34 and I’m a beginner to this Mutual Funds type of investment. I would like to invest around 5000 per month in SIPs for the long term of 17 years time frame for child education and marriage. Can you please suggest some mutual funds with the sharing ratio. Thank You so much for your valuable efforts and giving in detail explanation. Your blog topics are to the point and very simple to understand. I am planing to invest lump sum of 15 lakhs. But I am not sure how should I allocate my investment to various funds. I can stay invested for about 7+ years. You may set up STP (systematic transfer plan) from liquid fund to equity or hybrid funds. For ex : HDFC Liquid fund to HDFC balanced fund for next 12 months or so and you may remain invested in this fund for next 5 years. Same way you may consider one aggressive MIP Fund. You may make a small lump sum investment in Dynamic bond fund. I wanted to invest another 4000/- in DSPBR Micro Cap but found that new SIP registration is closed. Can SBI Small and Mid Cap be a suitable replacement for the DSPBR Micro Cap? If not please suggest a suitable small cap fund that I can use. Also I have a sum of 9Lakh that I need in 3 years time. Please suggest a suitable debt fund. My primary goal for this sum is capital preservation and indexation benefit in taxation with slightly more return than a bank FD (if possible). You may invest additional sum in Franklin Smaller cos fund itself. MF : 5yrs – BSL Frontline equity(1500) and Franklin small companies(1000). Please suggest a good diversified portfolio . I wanted capital preservation and returns more than 9-10%. Kindly note that Mutual fund investments are subject to risks and capital preservation may or may not be possible. But if the investments are for long-term, the probability of getting negative returns can diminish, provided one tracks the portfolio regularly. Kindly consider taking a Family floater health insurance plan (if you do not have one). The two existing funds are good ones. You may add one Balanced fund and one Diversified equity fund. Thanks for prompt reply. I will surely take up that insurance plan. The two funds that i have are for 5 yrs(vacation) . Is this portfolio ok? what overlap percentage is acceptable? You may consider L&T Value fund instead of ICICI Multicap. Firstly, let me thank you for putting up your valuable time in creating such a great website in terms of knowledge. would you recommend any changes in the above mentioned funds/ portfolio allocation? or would you suggest liquid/ultra short term/arbitrage funds are better instead of long term debt funds? Your portfolio has higher allocation to Large cap stocks, though there are two diversified equity funds. You may pick one mid-cap fund, if you would like to build a slightly aggressive portfolio, else a balanced fund for a moderate portfolio. You may go ahead with Dynamic funds, but do not that even debt funds are associated with some risks. Read: Types of debt funds. I would like to invest in some good short term fund for the next 1 to 2 years. Could you please help me choose between the following? Dear Chandan ..Kindly go through my article on, Best debt funds..
Hello Sir, I’m 30 yrs old earning 80k per month and investing 21k per month in MFs. i can further invest 4k more per month. please suggest me whether below portfolio is fine or need to change with any different fund in case i would have taken high risk by choosing below funds. My Goal is to build 50lakhs by next 10 yrs and 1 crore by next 15 years. Below are my portfolio diversification details ? Suggest you to go through below articles & available calculators, to analyze your case. I want to invest 85000 in sector fund for 3-5 years. I am looking for pharma sector of reliance. I compared SBI , UTI and TATA pharma but distribution of reliance looks good. Can you suggest is it good choice or not. I know pharma not performing well last 2 years. I want to do STP of big chunks rather small SIP or lump sum to achieve good NAV. Do you have any existing mutual funds in your Portfolio? AGE is 32 My goal is to have retirement corpus around 2.5 crore. I have investment vision of 20 years. Current 2-SIP started in last month of 3000/- each, Can invest upto 10000 more. BSL frontline (3000) SIP HDFC Tax saver (3000) SIP I have already large cap portfolio so I think I should create mid-small cap sip and one sector sip. I am looking for reliance pharma mutual fund. Please suggest your opinion. Kindly go through this article : Retirement goal planning & calculator. Small/Mid-cap suggestions : Best Equity mutual funds list. Kindly note that generally investments in sector fund can be associated with high amount of risk. So, if you understand and aware of them, you may go ahead and allocate a small portion of your investible corpus to sector fund. Ok. May I know your investment objective? If you need this money after around 12 months from now, suggest you not to invest in Mutual funds. You may consider traditional options like Bank FDs/RDs. HI, I HAVE SOLD A SMALL PROPERTY FOR 30 LAKHS I WANT TO INVEST IN MUTUAL FUND WITH EVERY MONTH PAYOUT, AND TO RE INVEST THIS PAYOUT IN MIDCAP FUNDS (G) FOR BEETER RETURNS. NEED YOUR HELP TO TELL ME THE PLAN ABOVE I AHAVE MADE IS GOOD OR BAD? May I know your investment objective and time-frame? Instead of reinvesting the payout, isn’t better to invest the amount directly in the Funds of your choice based on your financial goals???? Kindly read: Best Equity funds to invest in 2017-18. I also invest in ELSS- Axis and Franklin- total of Rs. 50,000 per year, with a PPF contribution and going to start a Term Insurance this year. Now, I am also planning to start investing in a Balanced fund. I am confused between HDFC Balanced and ICICI Balanced. ICICI Balanced has huge overlap with ICICI Value Discovery but is a better fund from what I’ve come to know. 1. Can you please suggest if my overall portfolio is good enough or do I need to cut any particular fund? 2. Which balanced fund would you recommend based on my current portfolio and goal horizon? Do I even need balanced fund? 3. Is HDFC Click2Protect a good Term Insurance Policy? Which policy would you recommend? 1 – I believe investing in 7 MF schemes may lead to over diversification. However, you can check portfolio overlap among these funds and decide, as all of the mentioned funds are good ones. 2 – HDFC or SBI balanced funds can be considered. 3 – Read : Best online term insurance plans. Thanks for the article. really good. sree is there any article on how mutual fund portfolio is rebalance or what is rebalancing. How and When of Portfolio Rebalancing With Calculators.. I am willing to make my portfolio bigger by investing another 4K in the coming months in SIP. Please suggest if the investment made my me are good decision or not. Moreover, I have long term plans like buying a house, childrens marriage, education and retirement planning. However, I am clueless how to go about investing and in what MF’s should I invest in the future. s. It is good according to you to invest the whole 6 Lakh as a lumpsump investment into 1 or multiple funds. If it is good to invest lumpsump I am thinking of investing 3 Lakh into HDFC Prudence Dividend fund which pays out regular dividend. Also 3 Lakh into 1 or multiple Growth Funds. Which route according to you should I take as I am really confused where should I invest my hard earned money into. My current monthly income is 30 K and 7.5 k every month gets invested in various LIC policies. May I know your age and time-frame of your Financial goals. Kindly provide LIC policy details (Plan name, sum assured, tenure & commencement date). Why would you like to get Regular dividends? Kid’s education goal planing & calculations. List of important articles on Personal Financial planning. Retirement Goals: 3Lakh/annum as per todays value after 26 years i.e., in 2042. The existing life cover may not be adequate to you, also these are traditinal low yielding plans. Suggest you to buy a Term insurance plan and you may discontinue these policies. If life is unpredictable, insurance cant be optional. Term insurance plan Vs Traditional plans. As your goals are long-term & objective is to accumulate wealth/corpus, kindly opt for Growth option instead of Dividend. I have horizon of 10+ years. I also save in ppf and nps(tier 1) I can go for moderately high risk category. But after going through analysis of other fund schemes now I have doubts about my choices. Kindly guide me. I have working spouse, Iam planning to invest from her side also, should the same schemes be chosen for her also? Your portfolio looks fine. You may retain one out of the two Mutli-cap funds (preferably SBI multicap). Franklin Flexi & SBI multicap are both diversified funds. If both of your goals are same, you may pick same schemes. Kindly read: MF portfolio overlap analysis tools. Best Equity funds for 2017. Hi sir I have a long term investment view on wealth creation. I have 4 ELSS Mutual funds via SIP. My age is 25. Please suggest me whether I am investing in right direction or not. Investment time – 10 yrs, goal – Purchasing a house. Apart from this I have a PPF account with annual investment of around 30000. I have sufficient life insurance so now my only focus is to get better investment returns. Please suggest any other investment scheme. I believe investing in too many funds that too from same fund category can be avoided. Kindly check portfolio overlap among these funds and try to limit to may be 2 funds. Kindly note that units allotted under each SIP of ELSS fund have a lock-in period of 3 years, so you need to plan your withdrawals accordingly. Read :Best Equity funds to invest in 2017-18.
i want to invest in mutual fund.but i am fresher.i have little quest? demat is compulsory for investment in mf. Dear alpesh ..It is not compulsory. Really Good Article….Thanks for sharing information..i read this article today. I am 30 year old, few months before i got SIP of 3000 Rs in ICICI value discovery Growth…this i have choosen for my retirement. Can u please tell me if i have done right? Or which is the best fund for retirement at this moment…considering investment for 30 years from now. It is a typical multi-cap equity oriented fund with around 60% allocation to Large-cap stocks. I believe that any equity fund which have been performing consistently well can be part of ones long-term portfolio. In case, you are planning to add one more SIP for long-term (30 years), you may add one mid/small cap fund. How to purchase mutual fund from different AMC using a single platform. I am thinking for using ICICI demat account in this case.Is this a good idea? Personally i do use icici direct for some of my investments, but the transaction charges are on the higher side but with good service. Kindly check out MF Utility platform for investing in Direct plans. MF utility – How to invest in direct plans? What are Direct plans of MF Schemes? For accumulating emergency fund – you may consider a Liquid fund + an Arbitrage fund. You can consider investing equity oriented plans for long-term goals. Reliance growth : 1000 (with insurance) horizon 10 yrs. Reliance equity opportunities : 2000 (1000 with insurance) horizon 7 yrs. Is it ok? My age is 50 yrs. I believe that there are better funds available in mid-cap space than Reliance growth fund & Equity opp fund. I would like to do some bulk Mutual fund investment from my NRI account. Is there any fund that we can consider instead of Bank Savings Account? My intention is to park the money for short term basis and switch to equity funds later. (in my knowledge, NRI investments should keep for 1year to avoid TDS.. is there any exceptional funds?). If you have to park for short-term basis, you may consider Liquid fund and then can do STP (Systematic Transfer) to Equity oriented funds (as per your requirements). Kindly note that STPs are considered as normal redemptions. So, taxes are applicable on these transactions (on liquid debt fund). Mutual Fund Transactions & Tax implications. How to select right mutual fund scheme. NRIs & FATCA Compliance requirement. I am 28 years old recently married, working in Central Govt. with 70k salary per month. 1) PPF- 35000/- p.a. started in 2015. Now am planning to invest in Mutual funds for my long time goals (above 8 years). 6) Franklin Tax shield- Every year 30000/- (may vary) as lumpsum for tax saving. Please give your opinion on my portfolio and their performance in long run. I am also thinking about fund size of funds sl.no: 2, 3. Is it ok if i have large size funds in my portfolio ? 1 & 2 are large-cap oriented ones. So, kindly check overlap between 1 & 2 and 3 & 6 funds. Read: MF portfolio overlap analysis tools. Kindly consider buying a Personal Accident insurance plan (if you do not have). Why is PA cover a must? List of articles on Personal Financial Planning! Thank You Mr. Sreekanth for your reply. 1) I have calculated portfolio overlap for funds: 1,2,3 and 6 and i found all combinations having overlap ratio below 35% except one combination. Overlap for funds 2 and 6 is around 50%. Is this portfolio alright ? or do i need to change anything ? Kindly suggest. 2) As you suggested i will go through Personal accident insurance plans and i will buy suitable plan for me. Please tell me which Helath insurance plans will be good for people staying in small villages ? Because they are staying at my hometown(village near by Warangal) and I am working in Bangalore. (Sometimes they are facing difficulties because, for any treatment they have to travel to Hyderabad or Bangalore for CGHS facility due to non availability of CGHS facilities near my hometown). Thank You and waiting for your kind suggestions. 1 – You may drop one fund where the overlap is >50%. 3 – Sufficient or not, you are the best person to judge/know. Lack of medical facilities is the problem and we can do anything about it. So, you may consider taking stand-alone health insurance mediclaim policies for them. Do they have any health challenges? Evaluate these factors when buying health plan. 1) If i want to drop fund no:2 then which large cap fund would to better to replace fund no:2 ? 3) As of now, my parents not having any health issues. Recently they have gone for full body check up and they were perfectly alright in all reports. Thank you Mr. Sreekanth for enlightening people like us for better financial planning. After reading all your articles I am in a position to plan my financial goals. Really your doing wonderful job. All your articles having great stuff. I am suggesting this website to all my friends and colleagues. Finally thanks to my friend for suggesting this website to me. 1 – Did you check their risk ratios 🙂 ? 2 – So, its a good time to buy health insurance for them. May be you can consider – Super top up health insurance plans. By the by, may I know your friend’s name?? 1) While shortlisting my portfolio I have considered risk factors (Standard Deviation, Beta, Alpha, Sharpe Ratio) and i found they are OK for all funds in my portfolio. 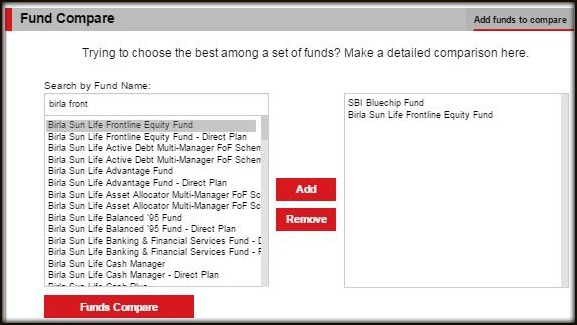 Now i am planning to replace “Birla SL FL equity fund” with Birla Sunlife Top 100 fund”. Is it a good fund to replace ? 2) I will consider your suggestion for buying Health insurance for my parents. My friend who has told about your website is Madhanagopalan. 1 – Birla Top 100 is a decent fund. But you already have SBI bluechip which is again a Large cap fund. So, kindly check the overlap and take decision. Thank you very much for all your advice and guidance to all investor. I m a NRI .. and Invested in below mentioned SIP ( Rs. 5000 each ) started 2 months back ) for long term retirement goal . Kindly advice above MF is ok or can i change the fund . All are decent funds. But you have 3 Multi-cap funds in your portfolio (ICICI/Kotak/Parag). So, suggest you to check the portfolio overlap among these funds and if the overlap is on a higher side then you may trim down your portfolio. How to select the right mutual fund scheme? I read your website from time to time. You are doing a nice job by providing valuable investment education to people. Please keep it up. I have a plan to limit my ELSS fund count to 2 after monitoring the performance for 2 years while keeping the total ELSS flow intact. Additionally , can I add one more midcap to my portfolio or continue with Mirae alone (it’s giving me around 80% CAGR till date, although the investment period is so small for this to be of any significance). Also, would like to know your view on BSL Pure Value fund. It interested me for the value (actually blend) oriented investment approach , which is quite rare in midcap space. Yes, you may trim down your portfolio a little bit. Best Equity Tax saving funds. How to compare and select the right mutual fund scheme based on Risk Ratios? You may continue with Mirae fund. I have been investing 3k per month in DSP Black rock micro cap fund through SIP since last two year. My investment horizon is between 15 to 20 years. I have observed that this fund has performed well but some of my friend’s suggested to me to invest in Frankllin Smaller Cap fund which is good fund compare to DSP in terms of Risk as well as Returns. I have also read your some articals where you also suggest for Franklin smaller cap fund. Now i am little bit confuse, should i stop my current(DSP) fund and start new SIP in Frankllin India smaller cap fund. Kindly stay invested in DSP micro-cap (considering your time-frame). It’s not possible to invest in all good funds. More I read, more in love with your website. Thanks for educating commerce illiterate like me. Admire your hard work and hope you continue to help people like me. Dear Vicky ..Thank you for your kind words. Kindly share the articles with your friends and do keep visiting! I am an NRI , I want to start investing in Mutual Funds with Lumpsum amount, it will be mix of 50% Balance fund , 25 % Midcap or Small Cap & 25% Monthly Investment plan. But, as you know market is at peak now and for next 2 to 3 months its may be on peak and then fall back. Till then I dont want to invest in Equity based mutual funds. Meantime can you please recommend me suitable Short term liquid investment plan/ instrument for 6 months to 1 years other than Fixed deposits, in which I can park these funds and earn higher interest than FDs and at the same time should not have entry or exit loads or Tax liability. The amount I want to invest is more than 10 Lakhs. Its very tough to predict the MARKETS and not advisable to TIME the markets. Completely agree with Sreekanth. There is never a better time to invest than now! Yes, technically you can invest in the Debt funds and choose a right time to invest in Equity when the market is Ripe, but given the current situation, there is no significant news in short that may affect the market (Brexit is over). And of you want longer, you may just miss the current bull market! However, take a step back, don’t invest just because you have 10 Lakhs, create a goal based investment, then check how much %age are you looking month-over-month and then distribute your funds in respective funds to achieve that goal. I am Sankar, 32, Married, 1 male child (3.5yrs), working in a private company with monthly income of 60K. My liability : LIC – 2.5K p.m, Home laon EMI – 21K, House Rent – 6.5K. Now i want to redistribute the Axis fund (Need advice) i.e., 3k to some other MF + wish to add 3K in some other funds (non TP scheme) as home loan is covering my 80c. Kindly advice which fund to choose among the following…. 2. DSP Black rock micro cap fund. suggest me some good fund with good return over a period of 10-15 yrs. I am a high risk taker. I am planning in SIP mode only for long horizon. 1 – If ok, kindly share details of your lic plans (Plan name, commencement date & tenure). 2 – Both the existing MFs are good ones. 3 – The shortlisted MFs are all mid/small cap oriented funds. You may pick one of them (can allocate a higher portion of your investible surplus) and also consider adding on Large-cap or Balanced fund to your portfolio. Kid’s Education goal and calculator. List of articles on important aspects of Personal Financial Planning. Thanks for the valuable reply. 2. I am going to continue the two existing MF’s but i am reducing 2.5 K from Axis LTE fund (investible surplus) and redistributing to Mirae Asset Emerging Bluechip fund or DSP Blackrock (Suggest anyone). Awaiting for your suggetion and any redistruibution if any (Advice Pls). 1 – Kindly note that you are UNDER INSURED. Consider buying a Term insurance plan and discontinue the existing policy. 3 – Read : Best Balanced mutual funds. 4 – Consider buying a Personal accident plan for self and health insurance for family (if you do not have one). Best Portals to compare health plans. As discussed, i have taken Term Insurance plan for a value of 1 Cr. and stopped the existing LIC premium payment. Not closed the policy. Also started Mirae Asset Bluechip SIP. Still to reduce the ELSS SIP amount, will do it in the next financial year. Thanks for the valuable guidance. my question is foolish. I invest in many Equity MF’s through SIP (Reliance mf). i have 34 SIP’s of 100 rupees through my HDFC salery account. Will i be charged for so many ECS/Billers (Netbanking or ATM). Dear prabhash ..May I know the reason for investing in so many funds? What is your investment objective(s)? / Strategy ? My Son wants to invest about Rs 15000/- P.M for long term SIP to substantiate Retirement as he has no PF/Gartuity because of contract service. Pl suggest some MF scheme to invest for 15-20 yrs with little Capital protection or no protection. How to select best mutual fund scheme based on the risk ratios? Hi, I would like to invest via SIP, 10 k per month for next 10 years.I have goal child education and marriage. so, basically, money i need after 10 years(education) and atleast after 20 years(yuonger kid marriage). I have lumsub 8 lakhs but hegitating to invest right now,since market is already in high and it is above 10 yr average. Do,I need to buy any debt oriented fund or not? is this right time for lumsum or SIP ? Lumsum works better if market low,SIP work better if market is volatile and u expect fund monthly..
Kindly read – Kid’s Education goal planning & calculator. May be in next 10 years,we may see new highs w.r.t market indices, who knows…So, let’s not try to TIME the markets. As you have long-term goals, any time is good time. You may create STPs (systematic transfer plans) from debt funds to equity funds. Your MF portfolio selection is fine. I want to save money as emergency fund. So, could you please tell me which mutual funds suits for emergency fund. MIP funds do invest a small pecentage of their corpus in equity securities. So, can be risky. You may consider liquid funds / arbitrage funds. i have decided emergency in two category for me. one is when i require money right at that moment. So, in this case i am expecting i should withdraw money at that moment instantly like withdraw from ATM. second type of emergency is like if i loose my job but, in this situation i am not expecting instant cash at that moment…i can wait for 1 day-1 week & the possibility of happening this emergency will be very rare. Before going to conclusion i want to tell my current investment. Above two funds grabbing major portion of my investment. one more query, for second emergency can we think of Debit fund. First type – Liquid fund + Cash at home + Balance in Sweep-in account can be considered. Second type – MIP is ok.
could you please check & tell me are above good funds to invest. one more note i fall in 20% tax bracket then should i select growth option for liquid fund…? 1 – Still Birla MIP 25 plan is a good pick. Regarding Birla Sun Life MIP II – Wealth 25 Plan, i have one observation on mutual fund online site that this fund have sip duration “Daily”. There is no monthly/quarterly sip option available & minimum sip investment also 1000 Rs. Dear Abhijit ..Minimum amount is Rs 1000 but monthly SIP is also accepted. Kindly check with your online platform provider. For Liquid Funds also i am getting only one frequency option that is “Daily”. Dear Abhijit ..I am not sure which platform you are referring to? Suggest you to kindly contact the service provider. Thanks for the Blog. I am new to the MF investment.I am just learning about MF from your blog. I am planning to invest Rs 10 lakhs for my two children future needs. The Time frame would be 10 yrs & 15 yrs. I am willing to take moderate risk. 1 ,Is it better to invest in SIP or lump some. 1 – As you have long-term goals, both can be beneficial. You can create SIPs and then can also make additional lump sum investments as and when you have extra investible surplus. 2 – You can allocate higher % say 40% to mid/small cap fund for long term goals, may be 30% in diversified equity fund and the remaining in a balanced fund. As you are investing for longer period, suggest you not to stick to MODERATE risk. In case if you cant afford to take high risk, you may allocate more to a balanced fund. What are large/mid/small cap funds? 4 – Yes. (if opted for Growth option). Assuming I invest for a goal with 10 years horizon, in a fund having current NAV as ’30’. Now suppose after 3 years NAV becomes 45 and after 5 years it reaches 55. Now I don’t want to redeem the units as the target not reached yet. It’s advised to move your corpus into safer investment options 1-2 years before the target time. As initial target period was 10 years, the equity funds need to be redeemed in 8th, 9th year. What if the NAV lies between 25-35 during this period. This will be a major loss even after making systematic investment, huge gains mid way and with having long time horizon. Above example could be really childish and improbable scenario but just a random scenario to learn about growth vs dividend options. Just framed above example to understand whether growth option should be followed blindly for long term investments or some % allocation should be in dividend option too? Let me tell you myself and my wife are investing (combined) 50 K per month in equities. Our portfolios are mixed of large cap, mid cap, ELSS, diversified, balanced funds etc. some of these investments are through SIP’s and rest others via STP route (no diff though from equity perspective). All these monthly investments are in growth plans only as we are looking for long term goals and not looking to redeem any of these funds before 8-10 years. Please advise your views on growth vs dividend option and should I reallocate some investment from growth to dividend? It is not a silly question, but valid one. But that’s how the investment plan works, we need to be keep on investing in good and consistent investment avenues and hope for the best. We can’t take away the risk but can try to minimize the impact of loss (can diversify across other Asset classless too). For fear of risk, if one avoids equities or equity funds (or investments which can beat inflation+taxes) then not investing sufficiently in these options can be more riskier (risk of wealth erosion) than actually investing. Even if you would like to invest in Dividend option, may I know what would you like to do with the received dividends? (consumption or re-investment)?? If by other Asset classes you mean other than equity, i.e. debt funds, liquid funds, arbitrage funds, FD’s etc then yes majority of our lump-sum corpus has been invested in these asset classes only. Please let me know if you meant something else with this statement. regarding next point of ‘fear of risk in equity’, let me tell you that’s not a concern at all. As mentioned earlier, we are investing 50k per month in equities and will invest more n more as and when market goes down. I still believe if I can forget this much amount for long time frame then nothing is better than equity. Only doubt in my mind is of % allocation between growth and dividend options within equity funds only. If I invest in dividend option, that would be dividend reinvest only. I am going to invest only that money in equity which can be forgotten for long long time. I am not looking to consume dividend amount for any expense or intermediary goals. Different asset classes include Real-estate Property too. If you have long-term investment horizon, you may kindly opt for Growth option. I am new to investing in MFs and have been following your blog for past few days. Thank you very much for guiding all the MF investors. I currently have Jeevan Saral – annual premium 120k rs – 5 years premiums paid, surrender value 450k- 35yrs maturity – Life insurance sum assured 25lacs and maturity sum assured 51lacs. We also took out Jeevan anand – annual premium 80k – 4 years premiums paid, surrender value 150k – 21yrs maturity- sum assured is 15lacs. I want to start investing in MFs looking to build wealth in long term. My age is 31yrs and looking to invest in SIPs for 15yrs. I currently have Life insurance for myself and my wife through an Insurance company other than LIC so do not need insurance. Our main purpose was investment and the LIC agent showed us some graph at the time of buying the policy which assured over 10% return but after reading your posts and through my own research I found this to be incorrect. Kindly please advise if I should continue to invest in the above LIC policies or should I surrender and invest it in MFs? The agent said I can withdraw the policy after 10 years, if I withdraw money after 10 years, how would they calculate return? will I get the loyaty addition for each year or just the LA declared at 10th year. Please advise if it is better to continue till 10 years or to surrender now? Do you believe that the total Sum Assured on your existing life insurance policies is adequate enough to cover the life risk? Traditional life insurance plans – a Terrible investment option. Kindly buy a Term insurance plan and you may then consider to surrender these plans. You have three large-cap oriented funds (1, 3 & 4). It may not be beneficial to invest in funds which are from same fund category. Other three funds are fine. Thanks for taking the time to answer my query. After your suggestion and reading further, I’ve removed “Axis long term equity” from my list as my 80C tax section is already full. The percentage of overlap accross SBI Blue Chip, ICICI focused bluechip equity and Birla SL Front line Equity Fund is very high (56% – 76%). I’ve choosen SBI Blue Chip as it is low risk fund and has low overlap againt FT Prima plus compared to ICICI focused bluechip equity and Birla SL Front line Equity Fund. But I’m little worried about the consistancy as during the 2008 fall of stock market, SBI Blue Chip performance was low compared to its peers(Birla and ICICI). Later it seems to deliver good performance after the new manager appointed in 2010. 1. Do you think I can still bet on SBI Blue Chip fund for long term time frame? If not, could you please suggest any alternative fund? 1 – It is a decent fund with low risk profile. 2 – The time-horizon is different for balanced fund, so kindly check the allocation % as per your expected/required goal amount/corpus amount. 3 – One Mid-cap or Small cap for >10 year period. Ex- DSP micro cap or Franklin smaller cos fund. Thanks so much for all your patience and for all your help in answering my queries. Thank you for your time in writing down details about such kind of mutual funds. I completely believe that mutual funds when invested in long run generate lot of wealth. Thank you dear Vipul for sharing the article. All the best! Dear Harish ..On risk parameters, Mirae fund looks good. One of the confusion I have faced when having multiple MF, especially Large Cap Funds is that of the portfolio overlap. If you have large number of Large cap funds, if they not selected carefully, may have portfolio overlap. Meaning, large of the individual stocks have the same configurations in various MFs. So diversification of sectors within the Large Cap may not happen leading to similar returns. I was trying hard to find out the best tool for the same and came across thefundoo.com It has a amazing way to depict the overlapping. I was wondering, if other can also share some of the outlook and dilemma in resolving these portfolio overlaps. In any two given equity funds, one may notice some percentage of overlap. But the key point is to avoid holding two funds with higher overlap say 75% overlap. As there is no point in holding two funds with same portfolios. Thanks Sreekanth. Realized that thefundoo.com is already there in your suggestion list. This overlap comparison tools have added a new dimension to my Investment. Realized that 2 funds in my portfolio are more or less the same, stopping the SIP for one of them and quickly to research to find another suitable one. I will come back with my picks, do help in suggestion. Dear Sreekanthji, I want to invest in Mutual Fund to accumulate savings and compound the value, say for 5 to 7 years. In this connection, which fund would be suitable for me. Apart from other funds, do suggest me suitable funds from SBI Mutual Fund. I can invest a maximum of Rs.5,000/- only per month. Thank you. You may consider HDFC Balanced fund + Franklin Prima plus + SBI Bluechip fund. Which is the best option in MF investment – Growth plan or Dividend re-investment plan. I read dividend re-investment will give us more value than Growth on long run. Pl. guide me. The Dividend Re-investment option can be slightly more tax efficient than the growth option for short-term (less than 12 months in case of equity funds). But this again depends on quantum and frequency of dividends declared by the scheme. If you would like to keep it simple then you may go with the GROWTH option. If holding period is not more than 12 months, it might really not make much difference. Hi Sreekanth! I am planning to invest for long term and I have high risk tolerance and want maximum return possible. I have decided to go with small cap or mid cap funds. However, I can not decide which mutual fund to go for. Can you please suggest me which mutual fund is best among – DSPBR micro cap , Franklin I smaller co. , Reliance small Cap. I compared them I find out even though DSP Micro cap seems like it gave more returns but it was more volatile then Franklin I smaller co. Which could make it look like that DSP have higher return. However in comparing absolute returns Franklin seems better option. Can you please suggest me what your thoughts are on these mutual funds and also please suggest me long term small cap mutual fund that I can have in my portfolio. Franklin Smaller companies is good pick. Personally, I have invested in this fund. I want to invest Rs 2000 more in SIP. Should I go for large cap or diversified fund, or mid cap or micro cap? Please suggest a good fund as well. May I know your investment objective and horizon?? My investment horizon is 10 years. And my basic objective is wealth creation with less risk. Please suggest a good fund in addition to those mentioned above. Dear Dipon..Suggest you to make additional investments in any of the existing funds itself. Axis LTE (if for tax saving) else Franklin Prima plus. Nice article Srikanth. One observation is for normal investors it is difficult to understand these standard deviation, beta ratios. Hence I adopted few strategies when I filter mutual funds for investment. Highest returns in last 10 years, 5 years, 3 years and 1 year. Second is ranking from Crisil and value research online. 3rd is checking how other investors are invest (AUM> Rs 100 Crores). How such fund is peforming in various market cycles. These would help investors to pickup right fund suitable to them. Dear Suresh..Thanks for sharing your views. But, besides return analysis, it would be better if one also evaluates the MFs on various risk parameters too. The information as mentioned in the article is readily available, so it is same as comparing the returns, here the investor has to just compare the risk ratios. How One Time Investment for any SIP based mutual fund possible as mentioned by Immanuel David? You mean to say that is it possible to do lump sum investment in a SIP fund? Kindly rephrase your query? Hi ,8 months back i have started below Investments thru monthly SIP of 1st every month in view of 15 years long term goal(House,child education, marriage,retirement).Apart from that whenever i have exces money after all my monthly needs..will invest equally in below funds of 25th of month.pleae suggest. Dear Gangadhra..Kindly stay invested, your MF portfolio looks fine. Read: List of articles on the key aspects of Personal Financial Planning. Im planning to invest in MF or some investment and forget (for at least 10 to 12 years) Rs 2(two) lakh rupees as a gift for my sisters daughter who is turning 8 years coming august. as this is a one time investment which the fund will be helpful for her education or towards her needs on that time upon maturity. could you please help me to choose a fund and if there is another option please let me know. im unable to select as im new to this MF, shares etc. whatever you suggest i will invest accordingly. You may consider investing in a Diversified Equity fund like Franklin Prima plus + in one balanced fund like HDFC Balanced fund. Kindly read: Kid’s education goal planning calculator article..